Collaborate with your team, suppliers and customers. HD video, audio, chat and share documents and your desktop with participants. At Tel2 we are passionate about Asterisk and Open source initiatives. We support the IAX2 protocol and Asterisk platforms. With Tel2’s offering we slashed costs and improved our overall Unified communications. Uptime is incredible and voice quality amazing, I can now enable staff to work from home, with peace of mind compliance is adhered to! Tel2 have been fantastic and helped us out every step of the way. Being a charity NHSound reached out and the best answered, why would we look else where?! With Tel2 Cloud you can easily add more lines as your business grows - a new staff member can be up and running in minutes! Even better you only pay for what you need. Tel2 Cloud is constantly being upgraded, at no cost or inconvenience to you. Unlike traditional PBXs which need expensive upgrades as time goes on,Tel2 Cloud is always up to date with the latest features. With our web portal Tel2 Now you can change features, add new lines, update call flows, view call records real time, listen to recordings and so much more. It's all at your finger tips and under your control. Tel2 Cloud is not tied to a physical location - answer calls when you are out and about, work remotely, register your number on multiple devices. It's up to you. Our pre-paid terms mean there are no long term contracts. You either Pay as you talk or buy one of our monthly calling bundles. Cancel anytime before month end and you won't be charged for the next month. Tel2 are by far the most professional and knowledgeable SIP trunk providers in the market, head and shoulders above the rest, nothing is ever too much! Simple to use portal that enable fast redeployment and changes, great team with great value and great service. which allows you to add DDIs for £1.50 each and channels at £1 each. Click here for details. Customers have two options when connecting their IP capable PBX to Tel2 - SIP Peering and Registered Trunks. Simply make the choice that best suits your business requirements. Easily add more trunks and lines as your business grows - you only pay for what you need. With our web portal Tel2 Now you can change features, add new lines, view call records real time and so much more. It's all at your finger tips and under your control. With lower set up fees, no maintenance and our low cost VoIP rates Tel2 SIP Trunking is an easy financial decision. Tel2 SIP Trunks are not tied to a physical location - so if connectivity on one trunk fails you can automatically failover to a secondary site. Combine your SIP Trunking service with selected Tel2 Cloud featues such as network call forward and call recording and increase the value of your solution at no additional cost. Tel2 Apps for both Apple and Android Smartphones allow customers to move away from traditional 'fixed' lines or handsets to their existing smartphone device without losing any of the rich features they have come to expect from their existing PBX phone system. 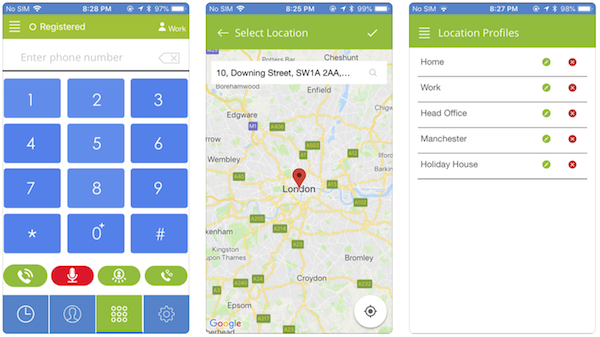 Our Tel2 Go Apps also now come with a unique feature called 'Location Profiles' which allow a user to use GPS locations to define how to handle their incoming calls, so instead of having to manually setup rules for their calls, or using time schedules - users can now create rules that are based on their physical location such as their home or office instead. By utlising our Cloud PBX features. businesses or individuals can now rid themselves of their inflexible, expensive handsets or fixed phone systems and move all or even just some of their lines onto existing mobile phones at no extra cost. To download the App that best suits your needs click here. By moving your existing phone lines to our Mobile Apps you no longer need to worry about physical hardware or cabling etc. * Mobile Rate achieved if utilising our Mobile Minute Bundles and all bundled minutes are fully utilised. Additional mobile minutes charged at 4p/min. ** Bundled country minutes include those countries listed in our bundled country minutes page and are subject to change. *** Click here to view our 'Pay As You Go' UK and International calling rates. All prices are in UK Pounds, include VAT and are charged in one minute blocks. *Rate achieved if all bundled minutes are fully utilised. Additional minutes charged at 4p/min. Bundled minutes excludes calls to Lycamobile and Premium services which are rated as 'UK Special' calls. © 2018 Cloud2Tel Ltd. All Rights Reserved.